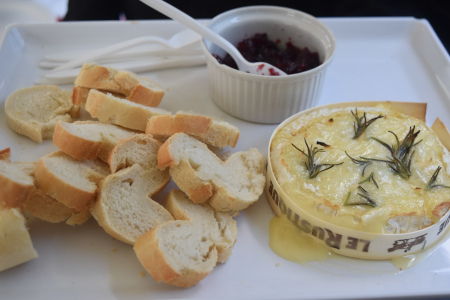 Baked Camembert with cranberry sauce is so easy to do, it's perfect for Thanksgiving or Xmas on the BBQ grill. 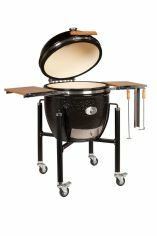 It took 10 minutes to prepare the cheese and a further 20 minutes to cook on my Monolith kamado. You can use my homemade cranberry sauce recipe or a shop bought jar as you prefer. Previously I've baked a whole Camembert directly on the charcoal and served with garlic bread but what makes this baked Camembert with cranberry sauce different is that I've taken the top off the cheese and baked it indirectly which adds a wonderful yellowy colour to the presentation. Made using cow's milk, Camembert is a soft white French cheese encased in a white crust. You need the Camembert to be ripe for this recipe because the end result that we're looking for is a viscous gooey mess that we can dunk our bread into. If you start with a Camembert that is under-ripe then it's going to take more than the gentle heat that I prescribe and you stand the risk of melting the whole cheese right onto the coals. Not the end of the world I admit...unless you're doing this on a gas grill! A ripe Camembert is a soft Camembert but too often you'll see people taking the wooden lid off the pack and pressing the center of the cheese to see if it is soft - this is wrong. Not least because the cheese will appear to be soft whether ripe or not if too many people have prodded it in the same place. The better test as to whether the cheese is ripe is to squeeze it across the diameter and judge the softness. If there's no "give", put it back or buy it and be prepared to wait 2 weeks before you use it. 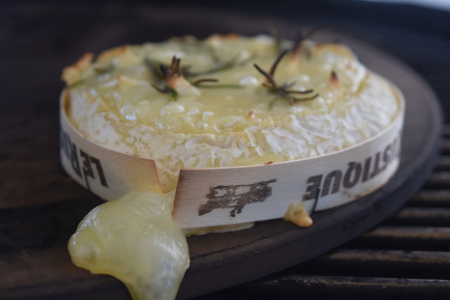 Camembert also can be broken down into those cheeses that have been made using pasturised milk and those using unpasturised or raw milk (in French "au lait cru"). To my mind, it's worth searching out the raw milk version simply to get a less industrially manufactured product and better flavour. Note: Traditional Camembert AOC (Appellation d'Origine Contrôlée) is also manufactured using animal rennet so this recipe is not suitable for vegetarians. There are however many Camembert style cheese that you can substitute should you wish. One Camembert cheese will serve about 6 people but that wholly depends on whether you're catering for cheese lovers like my family and in that case it's probably about 1 between 4 people. I've also made some caramelised pecans to add a bit of a crunch to my baked camembert with cranberry sauce. This is entirely optional but it's really easy to do and it can be done just before you prepare the Camembert so I've included the recipe here too. If using my homemade cranberry sauce recipe however then you need to make this in advance. Heat the non stick skillet over medium coals and throw the butter and sugar in the pan - you're lookng for the sugar to dissolve in the butter and then add the pecan nuts. It'll take about 5 minutes for the coating on the nuts to harden and then you can chop them up ready for serving. Remove the Camembert from it's packaging, discard the wax paper but keep the wooden basket. Insert the sliced garlic and rosemary sprigs into the Camembert, replace the cheese into its wooden basket and you're ready to cook. Transfer the baked camembert to a cheese board, slice or break open the bread and dunk it in the Camembert. Just accept it...it's gonna get messy! A light topping of cranberry sauce. Chop and sprinkle the caramelised pecans over the top.